Subject – "Hotel California” – a 1976 recording by The Eagles, released on Warner/Asylum Records and featuring designs, artwork and art direction by Kosh. The follow-up to the successful 1975/early 1976 releases – the Grammy-nominated One Of These Nights and the huge-selling Eagles: Their Greatest Hits 1971-1975 - Hotel California was the first album to feature guitarist Joe Walsh, whose playing and song-writing influence brought the band from their more country-leaning efforts towards a more mainstream rock audience. During the year and a half spent in the making of the record, drummer/singer/lyricist Don Henley emerged as the “featured player”, and much of the record’s tone and subject material reflected his commentary on success (and the excesses it can breed), love lost and just how strange life in California can be. With their arena-rock-ready musicianship now well-honed (Don Felder and Walsh on guitars and Henley and Randy Meisner providing the rhythmic fundamentals), the band was now ready for the big time and Hotel California proved that they could create music that could both sell countless millions of albums (the record went platinum in 1 week!) and make a countless millions of fans in stadiums around the world cheer loudly as they sang aloud every word of every hit song. Hotel California won the Grammy in 1977 for Record of the Year and the songs “Life in the Fast Lane”, “New Kid in Town” and the epic “Hotel California” (which you can never leave) became enduring classic Eagles tracks. “I had been designing album covers and promotional material in London for The Rolling Stones, The Who (Who’s Next?) and The Beatles (Abbey Road) at Apple and working closely with John Lennon on his 'War Is Over' campaign. Peter Asher was head of A&R at Apple Records at the time. After a 6-month stint in New York, the family moved to LA in 1974 and I soon fell – with great enthusiasm - into the West Coast music scene. Heady times. I began working with Peter Asher again, who was now managing James Taylor and Linda Ronstadt in LA. This led me directly to Linda's label - Asylum - and the Eagles. Irving Azoff, their manager, called me in to meet Don Henley and Glenn Frey (they were still friends at this point so the conversation was fresh and lively). Don Felder was also there, along with the amazing falsetto, Randy Meisner. It was a jolly affair - the Eagles were huge, enjoying hit after hit, and the California rock scene was burgeoning. Their producer and engineer, Bill Szymzyk, brought in an acetate of Hotel California - destined to be the first cut on, and the title of, their next album. It was an obvious hit. 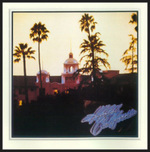 For the album cover, Don wanted me to find and portray THE Hotel California – a hotel which would best-exemplify a classic 'California hotel', and to portray it with a slightly sinister edge. Photographer David Alexander and I set out to scout suitable locations. We photographed three hotels (including some with a rather ‘seedily genteel’ character) that fit the brief and large prints were made for approval. By now I was dealing mostly with Henley - the rest of the band would saunter in as we progressed and mutter their approvals – and he preferred more sumptuous images. The shot of the Beverly Hills Hotel against the golden sunset was deemed the favorite. To get the perfect picture, David and I had perched nervously atop a 60' cherry picker dangling over Sunset Boulevard in the rush hour, shooting blindly into the sun. Both of us brought our Nikons up in the basket and we took turns shooting, ducking and reloading. We used high-speed Ektachrome film as the light began to fade. This film gave us the remarkable graininess of the final shot. Beautiful dye-transfer prints of the chosen frame were made by the great Ted Staidel. I designed and drew out the master Hotel California logo which was to become the theme of the package and the promotional materials. The script was almost impossible to bend in real neon and so, after many experiments, Bob Hickson was commissioned to airbrush the neon effect on the logo – which he did wonderfully - and it was pasted over the Beverly Hills Hotel sign on Ted's print. The whole piece was then re-photographed, re-printed on the same stock as the original image and retouched to match the grain and hide the surgery. Next we organized the gatefold spread – a photo of the band surrounded by friends in the hotel lobby. This was shot inside a cleverly re-decorated flop house, called The Lido, in Hollywood by David Alexander. Our combined rock 'n' roll friends were all invited. Nobody knows what the sinister figure lurking in the balcony window is doing - or who he is. I assume he must have been a benign spirit as Hotel California went platinum immediately (and then some!). A lot of great talent contributed to this LP’s packaging. Photographer Norman Seeff was commissioned to shoot portraits of the band, which were arranged as a gritty black and white fold-out poster montage that was to be inserted in the package. Throughout the package (and the related promotional items), the graphics were carefully coordinated to retain the unique color and typographic schemes. It was, for its day, and expensive effort, but a very satisfying one. It is interesting to note that I got tangled in the same heated debate with Asylum Records over the using of the band’s name on the cover that I had years earlier with EMI in London. I thought it unnecessary to use the words, ‘The Beatles’ on Abbey Road considering the album was so eagerly anticipated and The Beatles were the biggest band in the world at the time. Such was the case with Hotel California. By 1976 the Eagles were the biggest band in the world and eventually only the title, ‘Hotel California’ appeared on the original cover of the album. As a designer and art director, KOSH became prominent in the mid-1960s with the Royal Ballet and the Royal Opera. He met up with the Beatles towards the end of the decade and, as creative director at Apple Records, was responsible for design, promotion and publicity for The Beatles. His clientele expanded to cover the cream of the British rock bands including the Rolling Stones, the Who, and many others. He handled John Lennon’s crusades including the "War Is Over" campaign in 1969 and art-directed and produced the world-renowned Abbey Road and Who’s Next? album covers, among many others. Kosh became well known in the London avant-garde art scene, designing and producing exhibitions, posters and books. After garnering several awards with the London Design & Art Directors Club, he was elected to the British Art Directors’ Jury before moving to Los Angeles in 1974. A seven-time Grammy nominee, Kosh won three of the coveted awards for his work for Linda Ronstadt (Lush Life, Get Closer and Simple Dreams). He served as faculty member of Otis Parson’s Institute of Art and on the Board of Governors of the National Recording Academy. Kosh’s client roster has included Capitol Records, Tri-Star, Disney Studios, Fox Television, CNN, MCA, MGM, NFL (he designed the Super Bowl XXI logo), Disney, Sony Records and Warner Bros., Records. Artist clients include The Beatles, Jimmy Buffett, the Eagles (including Hotel California - voted No.6 in Rolling Stone Magazine's "100 Best Album Covers of All Time"), Humble Pie, Randy Newman, Pointer Sisters, Linda Ronstadt (Kosh has prepared all her graphics since 1974), Bob Seger, Electric Light Orchestra, Ringo Starr, Spinal Tap, Rod Stewart, James Taylor, 10,000 Maniacs, T. Rex, The Who and many others. A display of his more prominent graphics was exhibited at the Rock & Roll Hall of Fame Museum. Susan Shearer and Kosh formed Ten Worlds Productions in 1995. Tenworlds achieved critical acclaim for their work on The Last Days of Kennedy and King for TBS and the ten hour documentary 100 Years -100 Movies for the America Film Institute and CBS. In 2006, Ten Worlds produced and directed DECLASSIFIED: The Rise and Fall of the Wall, which shed new light on the Berlin Wall for The History Channel. Tenworlds is presently producing a 13 part series of DECLASSIFIED documentaries on subjects such as John Lennon, Fidel Castro, the Tet Offensive, Charles Lindbergh, Joseph Stalin and World War 1 for The History Channel, with Kosh directing. Aimed at younger audiences, these shows combine interviews with U.S. presidents, top echelon politicians and rarely seen archival footage, overlaid with innovative graphics and searing rock soundtracks. Ten Worlds is also in pre-production for a documentary celebrating the 40th anniversary of The Beatles’ Apple Corps. To see more of Kosh’s work, please visit – http://www.tenworlds.com/. I've been surfing online more than 2 hours today, yet I never found any interesting article like yours. It's pretty worth enough for me. Personally, if all web owners and bloggers made good content as you did, the web will be much more useful than ever before.